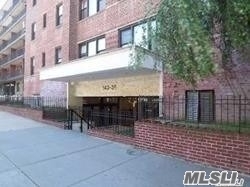 One Bedroom Co-Op Conveniently Located In Downtown Flushing- Large & Spacious With Living Room/Dining Room, Kitchen, Bathroom. Located Near - Transportation/Subway/Railroad, Restaurants, Shopping, Medical Center And Much More! Apartment Is Being Sold "As Is".